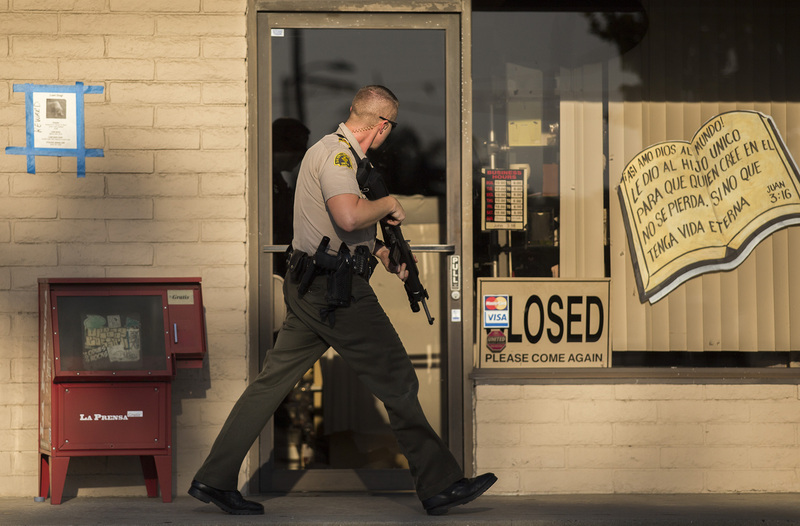 A San Bernardino County sheriff’s deputy searches a Rancho Cucamonga business complex for an armed robbery suspect Saturday, Aug. 13, 2016. 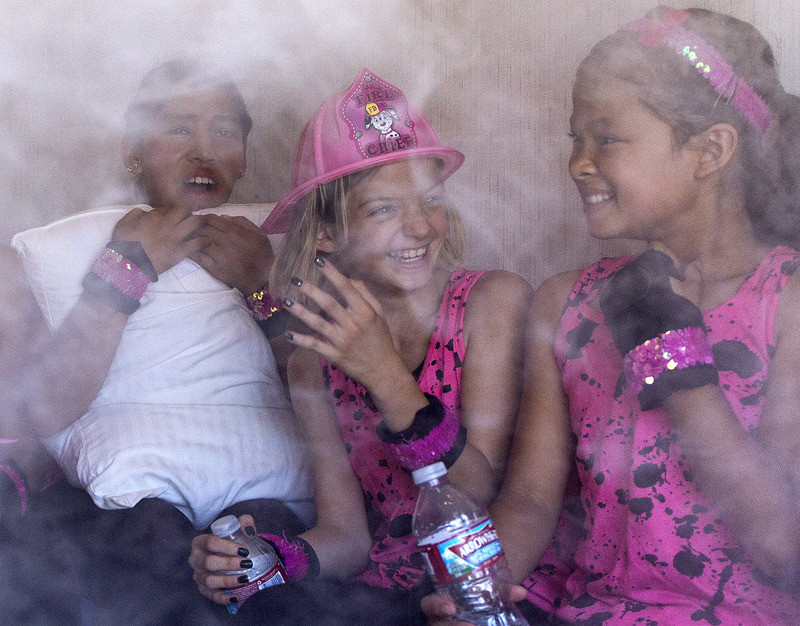 Gymnasts from a Beaumont Community Resource Center team experience what it’s like to be in a room filling with smoke during Beaumont’s Public Safety Appreciation Day on Saturday, Oct. 10, 2015. The smoke was fake, and part of a demonstration given by Joe De La Torre and Caleb Pohren of the Morongo Band of Mission Indians Fire Department. 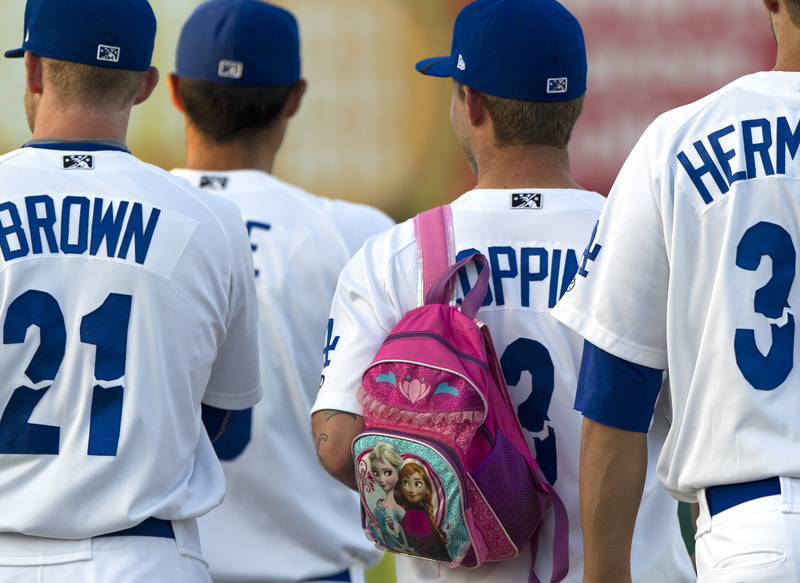 Rancho Cucamonga Quakes pitcher Corey Copping carries a “Dora the Explorer” backpack to the bullpen before a game against the Modesto Nuts in Rancho Cucamonga Saturday, Sept. 3, 2016. Team tradition dictates that a pitcher must wear the backpack after giving up a homerun and until the next pitcher gives up one; Devan Ahart of the Lancaster JetHawks homered against Copping Sept. 1. An Upland police officer photographs a crash scene on Euclid Avenue near 8th Street Wednesday afternoon, Oct. 26, 2016. 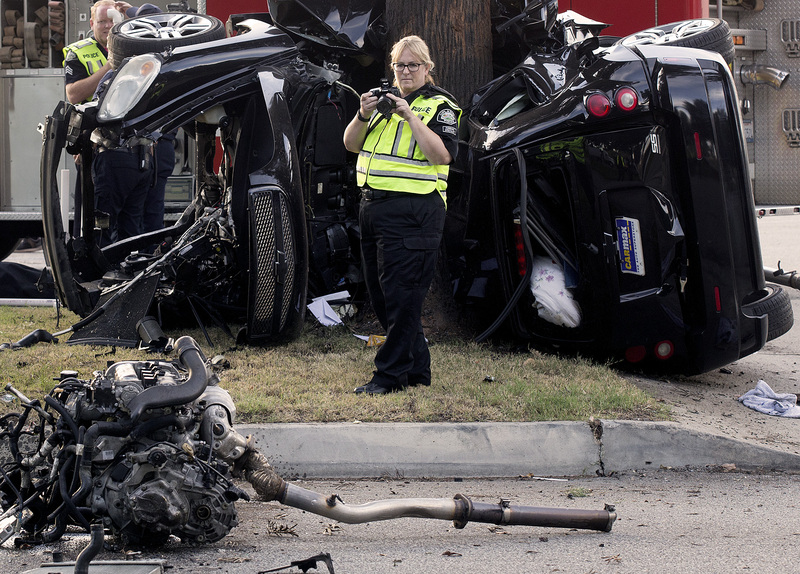 The Chevrolet HHR was racing with another car south on Euclid when it hit railroad tracks and lost control. The lifeless body of Geoffrey Eugene Haffner, 23, of Upland remained in the vehicle when this photograph was taken. Firefighters eventually used extrication tools so coroner staff could retrieve his body. 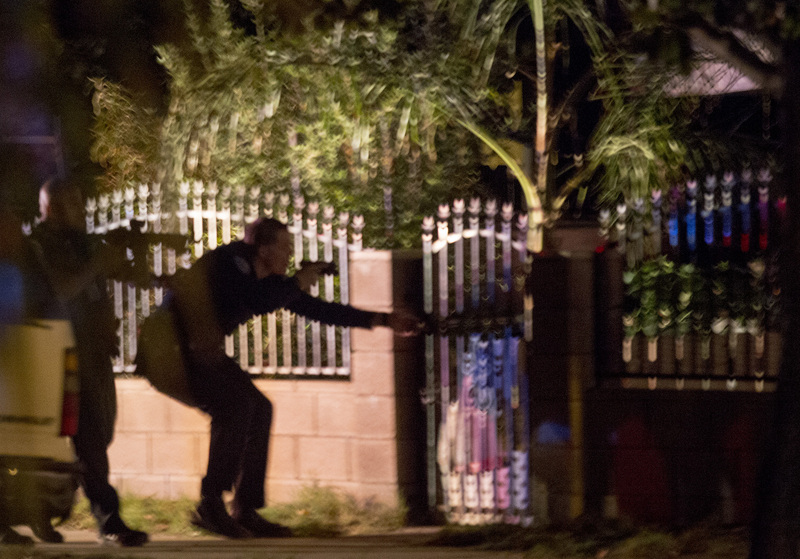 San Bernardino police officers prepare to enter a home at 994 West 6th St. as they investigate a suspected armed and barricaded man Friday, Oct. 21, 2016. Police later learned the man had already left the house, only to return and be arrested on suspicion of child endangerment, criminal threats and discharging a firearm in city limits. Lt. Brian Harris said he had fired a gun into the air after arguing with family. 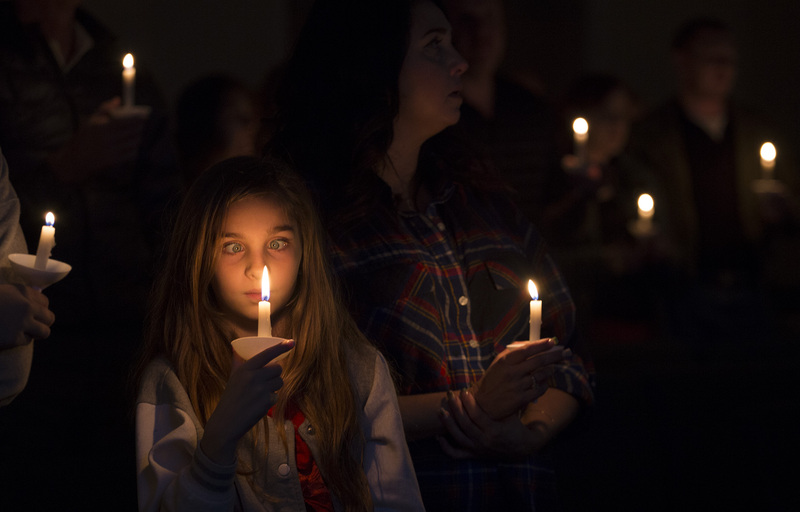 A girl amuses herself during a Christmas Eve celebration at the Center for Spiritual Living in Salt Lake City, Utah Dec. 24, 2015. Cindy Rich, left, applies a tourniquet a bit too tightly to Brisena Rivera at Cucamonga Elementary School in Rancho Cucamonga on Feb. 2, 2017. 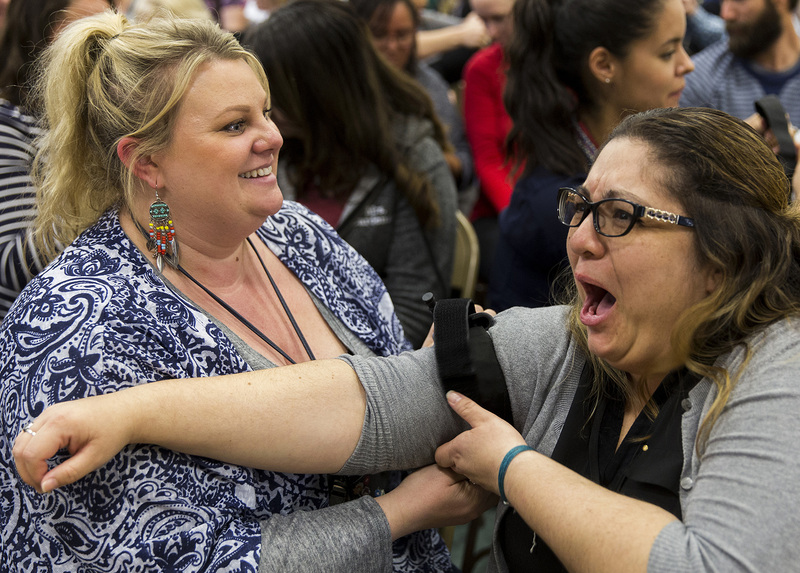 The two third-grade teachers were taking part in active shooter safety training developed by Rancho Cucamonga Fire Department and San Bernardino County Sheriff’s Department. The program’s aim is to empower people not to become victims and to administer potential life-saving measures while awaiting first responders to arrive to the scene of a terror attack. Though the subject matter is dark, organizers said they try to keep the mood light. Rich Elders paints the mast of a friend’s fishing vessel in Woods Hole, Massachusetts in the summer of 1995. 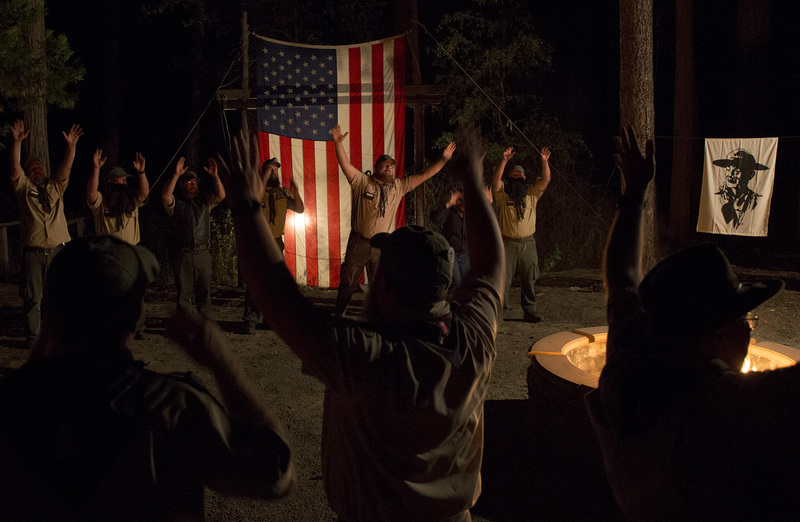 Owl Patrol performs a campfire skit for fellow Wood Badge course attendees at Idyllwild’s Camp Emerson on Friday, Sept. 11, 2015. The likeness on the banner at right is that of Sir Robert Baden-Powell, who founded in 1907 what became the World Scouting Movement. 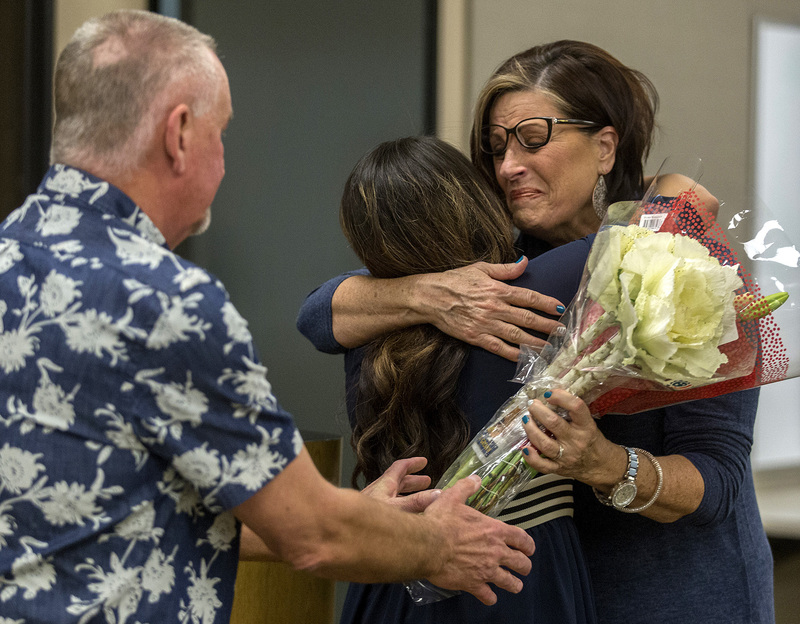 Carolyn Evans, right, hugs Elise Rodriguez as Evans’s husband Jeff reaches for the bouquet of flowers at the Corona Police Department Saturday, Feb. 11, 2017. The flowers were for Rodriguez, a Corona dispatcher who instructed Carolyn how to perform CPR on her husband Jeff as he suffered cardiac arrest Jan. 21 in their Corona home. The Evans were holding a press conference to thank Rodriguez and the first responders who helped save Jeff’s life. 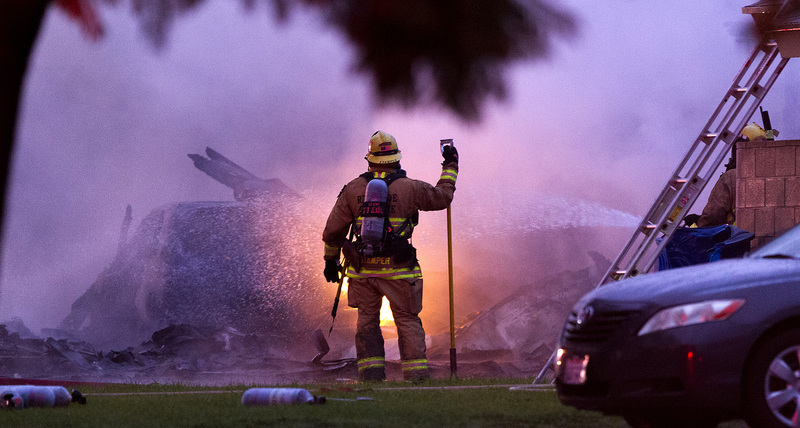 A Riverside firefighter monitors a burning Chrysler PT Cruiser at a home on Rhonda Road where a small plane crashed Monday, Feb. 27, 2017. Of the five people on the plane, three were killed and two were injured in the crash that destroyed two homes. No people on the ground or in the homes were hurt. 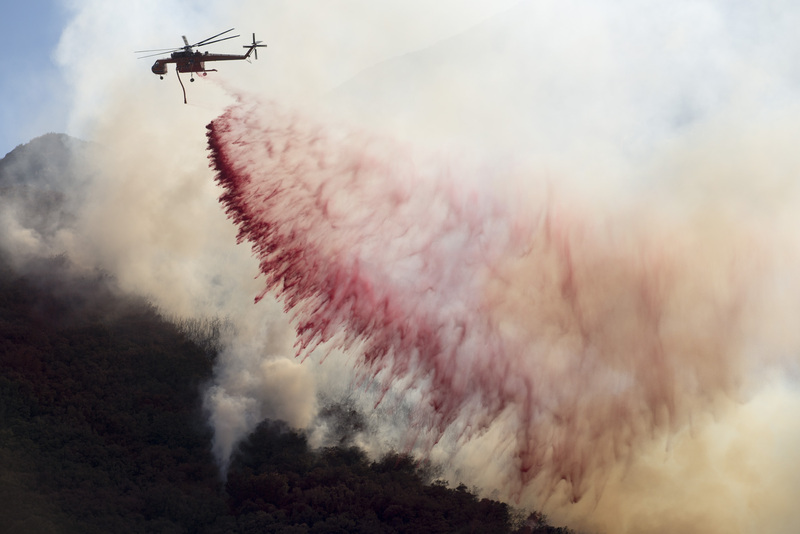 A skycrane helicopter drops Phos-Chek, a flame retardant, onto the Blue Cut Fire in the Devore area Thursday afternoon, Aug. 18, 2016. San Bernardino County Fire Chief Mark Hartwig, left, is consoled by a friend at a candlelight vigil held for his son Dawson Hartwig at California Baptist University in Riverside Sunday, Feb. 5, 2017. Dawson Hartwig was found drowned in Lake Arrowhead early the previous Sunday. 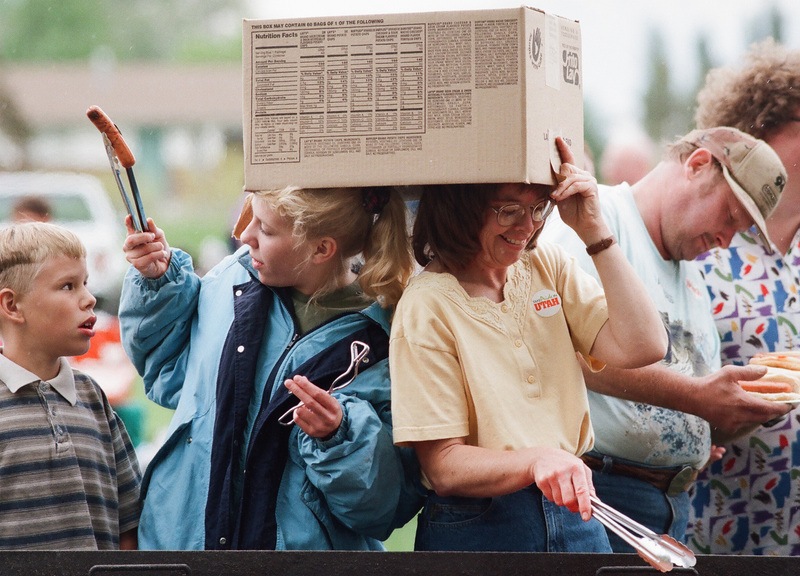 A potato chip box becomes an umbrella for Shiela Todd, left, and Eileen Woods at Sharon Park in Orem in the summer of 1996. The pair were volunteering at a barbeque held for Orem’s Take Pride in Utah Day. Other volunteers cleaned up the surrounding neighborhood. 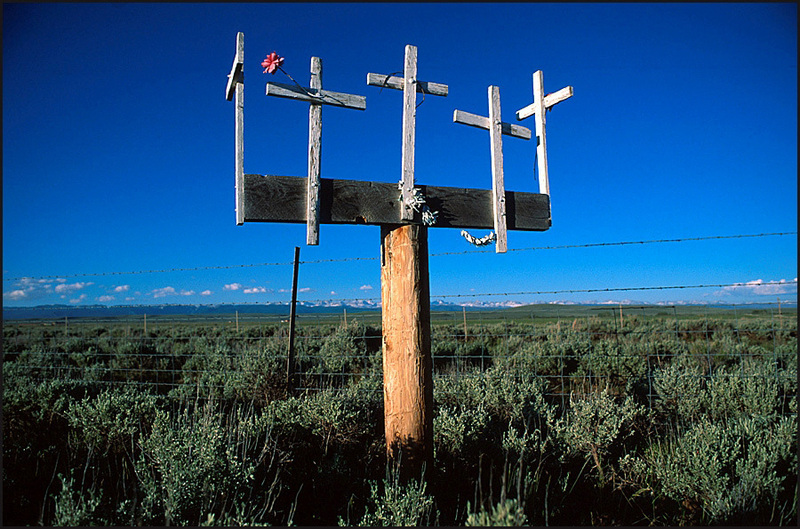 A roadside memorial pays homage to victims of an accident along Route 189 in Wyoming.